The award was for a series of 5 photographs of Chinese citizens "Born in 1949." The photographs were made in China during 4 months in 1999 - the 50th Anniversary of the founding of the People's Republic of China. 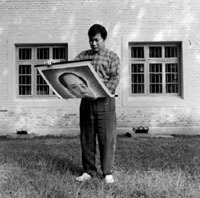 Juror: Xu Bing, Artist.